Edward Cocker, The Pen’s Triumph: being a copy-book, containing variety of examples of all hands practised in this nation according to the present mode, adorned with incompatable knots and flourishes… (to be sold with other of the authors works, by John Dowse Stationer, at the great north door of St. Pauls Church London, 1659). 23 (of 27) engraved plates. This new year’s eve, instead of drinking three pints of wine, why not use it to make your own batch of writing ink? 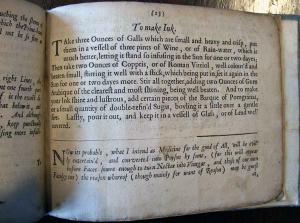 Here’s a recipe written by Edward Cocker (1631-1675). Cocker was a London mathematician and engraver, who taught writing and arithmetic. His extraordinary talent as a calligrapher enabled him to create over 20 copy books, which included alphabets in “German”, “Italian”, “Roman”, and “Print” hands. 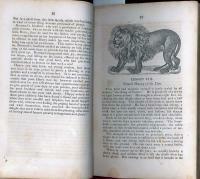 In addition, his manuals offered instruction in cutting pen nibs, holding the pen, and the making of ink. These actual recipes are rare and Cocker’s continues to be a resource to contemporary artists and historians. Wood-engraved block by John S. Horton, for John J. Harrod, The Introduction to the Academical Reader (Baltimore: Harrod, 1830). Hamilton 1742. Woodblock is a gift of David B. Long in honor of Gillett Griffin. Harrod’s book is one of several thousand American imprints illustrated with wood-engravings, identified in the Sinclair Hamilton collection within the graphic arts division. The collection is searchable online as well as in the published catalogue: Early American Book Illustrators and Wood Engravers, 1670-1870 (GA Z1023 .P9 1968). 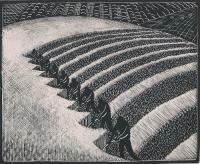 The process of wood engraving involves the cutting of an image in relief on a hard, end-grain block of wood. The engraver cuts away the parts of the block that are to remain white in the finished image. The hardness of the wood allows the engraver to cut multiple thin lines, creating a more complex image than was possible with the soft matrix used for woodcuts. Wood engraving was the technique of choice for book illustration in the early nineteenth century. 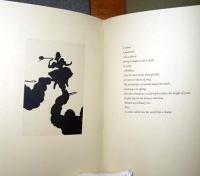 Long before Kara Walker, there were many folk artists practicing the tradition of cut-paper silhouettes. Pictured above is one page from an album of black paper scenes created by a young girl in memory of her visit to Yverdon in Switzerland. 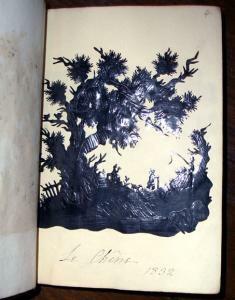 The book is dated Londres 3 Mai 1832 and includes 15 elaborate silhouettes cut from waxed black paper to fit the size of the page. The wax provides a shine that catches the light and adds depth and dimension, not often found in American cut paper work. 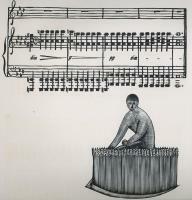 Most images are captioned, presumably by the artist, with one entry reading "A ma chere petite Elise en souvenir de son affcte LR." The album has one ownership insciption on the marbled pastedown of P. Atkinson, Belmont, Shipley, with a blindstamp on the free endpaper of the same address. 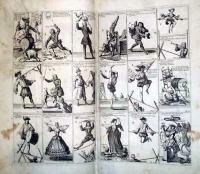 Here are only 3 of the 73 engraved plates from The Great Mirror of Folly, offering satirical scenes in the rise, progress, and downfall of stocks in France, England and the Netherlands during 1720. The volume is also informally known as The Great Bubble Book after the speculator’s bubbles that burst, causing the first great stock market crash in September of that year. This is an unusual book for many reasons. It was issued without an author or publisher or even city of origin identified. 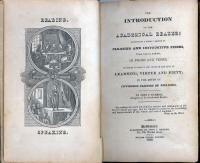 Each individual volume appears to be a unique compilation of prints and texts, holding between 49 and 74 images from up to 56 different engravers. The print on the left has no signature or title within the design as is common with Japanese woodblock prints. It has been attributed to Katsushika Hokusai (1760-1849), whose career spanned sixty years, producing more than 30,000 prints. He was not only a master of Ukiyo-e (pictures of the floating world), but actively studied Chinese and Western techniques, in the last years of the Edo period. The image is of an Ama, or fisher-woman who specialized in diving for abalone (awabi). I have not been able to find this work in any of the several dozens of volumes on Hokusai in Marquand Art library, nor was it included in the Smithsonian’s extensive retrospective of the artist’s prints and books. Their website is a wonderful source of biographical and stylistic information: http://www.asia.si.edu/exhibitions/online/hokusai/launch.htm. If anyone has information we would be interested in hearing from you. Hokusai, a child prodigy, is best-known for a series of views of Mount Fuji, including 46 unique scenes at different times of day and seasons of the year. Both Hokusai’s Ama and selections of the Mt. Fuji series will be on view in our gallery next year when we exhibit the Gillett Griffin collection of Japanese prints on deposit in the Graphic Arts division, Rare Books and Special Collections, Princeton University. William Wallis (fl.1816-1855) after Thomas Hosmer Shepherd (1793-1864), Temple of the Muses, Finsbury Square. London: Jones & Co., 1828. Etching and aquatint with added hand-coloring. As a boy, James Lackington (1746-1815) worked as a meat pieman. As an adult, he became one of the most successful booksellers in all of London. If you were looking for literature in the late 18th-century, you would have made your way to No. 32 Finsbury Place South in the southeast corner of Finsbury Square. At that corner, you would check to see if the flag on the huge circular dome of the Temple of the Muses was flying. That way, you knew if Lackington was in residence inside his remarkable bookshop. 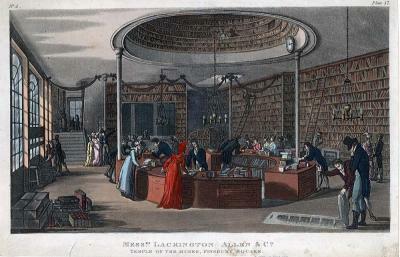 Books were sold for cash, at prices listed in Lackington’s annual printed catalogues, such as A Catalogue of Books, for the Year 1803, Containing Eight Hundred Thousand Volumes in all Languages and Classes of Learning, the Whole of which are Marked at Low Prices, for Ready Money, and are Warrented Complete. 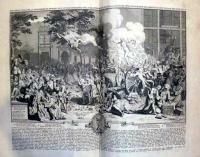 (Rare Books, Ex 2005-0187N). After Lackington’s death, his son continued the business until the shop burned down in 1841. Walt Whitman, As I Watch’d the plovghman plovghing; mvsic by Philip Dalmas, woodcvts by Wharton Esherick (Philadelphia, 1927). Gift of David B. Long in honor of Gillett Griffin. Trained as a traditional painter, Esherick had a brief career as an illustrator before he bought a Washington hand press and in 1920, began cutting and printing limited edition woodcuts. Around this time, he met Harold Mason, owner of the Centaur Book Shop in Philadelphia, who was interested in publishing fine press books. It was a good match. In 1924, the Centaur Press published its first book, Walt Whitman’s poem, Song of the Broad-Axe, with woodcuts by Esherick. 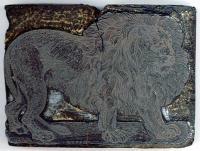 This led the artist to other commissions and other book projects, all printed with large-format woodcuts. 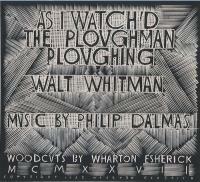 In 1928, Esherick made a sequence of nine woodcuts for As I Watched the Ploughman Ploughing, a poem by Walt Whitman set to music by Philip Damas. The Franklin Printing Company issued in an edition of 200 copies and four of the woodcuts were reprinted in the February 1929 issue of Vanity Fair. The Princeton University Library is pleased to announce the acquisition of one of the most beautiful books created in the twentieth-century, À toute épreuve, with text by the French poet Paul Éluard and 79 original woodcuts by the Catalan artist Joan Miró. 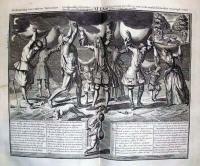 The entire volume can be seen in the upcoming exhibition entitled, Notre Livre: À toute épreuve. A Collaboration between Joan Miró and Paul Éluard, in the Milberg Gallery for the Graphic Arts, Firestone Library, from February 22 to June 29, 2008. To create this book, Miró cut over 233 woodblocks working over the better part of eleven years. He used planks of wood collaged with plastic, wire, old engravings and bark paper to achieve images that practically dance across the page. "I am completely absorbed by the damn book," wrote Miró to his publisher, Gerald Cramer, "I hope to create something sensational. . . ." The final volume has a brilliance of invention and a vitality of form and color, rarely found inside the cover of a book. The exhibition opening will be celebrated on Sunday, March 9, 2008, with Elza Adamowicz, Professor of French and Visual Culture, School of Modern Languages, Queen Mary, University of London, presenting the talk "The Surrealist Artist's Book: Beyond the Page" in the Betts Auditorium, School of Architecture, at 3:00. A reception will follow at 4:00, in the Leonard L. Milberg Gallery for the Graphic Arts on the second floor of Firestone Library. Et rit sur la pointe des pieds. Où tous les êtres sont pareils. Laughs and laughs and laughs on tiptoe. 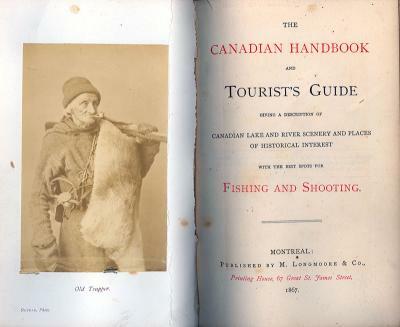 During the nineteenth century, when photography was still a new art form, book publishers would cut and paste individual, original photographs into their books as illustrations. It was an expensive, time-consuming process and so, you might think it was only very limited-edition publications that were illustrated in this way. This is not the case. One reason we know this is is by looking at the Princeton University Library, where there are hundreds of examples of books—novels, textbooks, government documents—that include original, now historic, photographs. We are now adding a special subject heading to books with original photographs in them to make them searchable in the main online catalogue. If you would like to try this search, go to http://catalog.princeton.edu and type: Photographs, Original—Illustrations in books into the search box. If you find books with photographs that has not yet been noted, please sent me the information and we will add the heading. Continue reading Illustrated with Original Photographs. Rockwell Kent, designer. 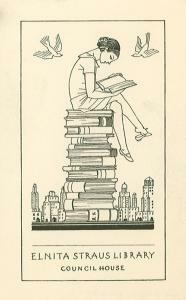 Bookplate for Elnita Strauss Library, Council House. 1936. Although the collecting continues, the entries are in and the 2007/2008 Elmer Adler Undergraduate Book Collecting Prize is closed. I would like to thank all the students who entered and wish them the best of luck. The judges are reading the essays and will select the winners before the end of the calendar year. These names will be announced at the Winter Banquet of the Friends of the Princeton University Library on Saturday, February 2, 2008 and to the general public on February 4. In order to market the moderne interior design aesthetic on the rise in the 1920s, French publishers produced limited-edition portfolios using a traditional technique--known in France as pochoir. 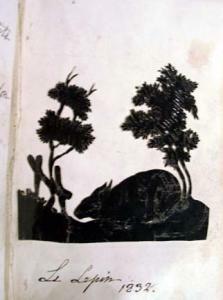 The technique, which involved the hand application of color to a print using a series of carefully cut stencils (pochoirs), produced luminous images ideal for promoting the new approaches to interior design. The exhibition brings to light the tensions between traditional and modern design that existed in the period, and provides design solutions that will delight today's audiences. La Guirlande. 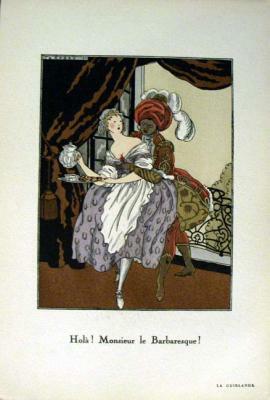 Album Mensuel d'Art et de literature Sous la direction litteraire de Monsieur Jean Hermanovits. Sous la direction artistique de Monsieur Brunelleschi. Paris: s.l., 1919-1920. La Guirlande is one of the rarest of the Art Deco magazines with pochoir plates by Barbier, Brunelleschi, Taquoy, Vallée, Bonotte, Domergue, and others, printed by Jean Saudé. E.A. (Emile-Alain) Séguy (1889-1985). Papillons. Paris: Éditions Ducharte et Van Buggenhoudt, [ca. 1928]. 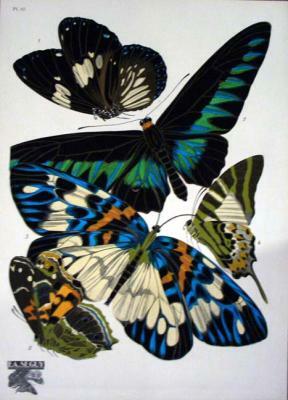 The stunningly colorful Papillons holds 20 pochoir prints illustrating a total of 81 butterflies. The purpose of the volume, beyond creating something of astonishing beauty, was to record rare or exotic specimens from museums and privates collections that would inspire decorative arts designers. Séguy produced eleven albums of illustrations and pattern, offering examples of design for textiles, ceramics, wallpaper, advertisements, and other utilitarian applications.